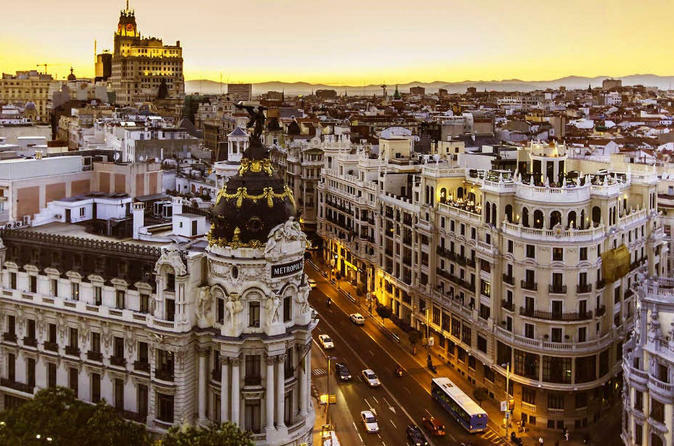 Enjoy this private tour of Madrid with your private luxury vehicle (8 hours) and your own professional tour guide for 4 hours. Where you will be able to see the most important sites of Madrid. After this, you will head to Las Rozas village for some shopping time, where you will find more than 100 shops with prices up to 60% off from retail price. Your driver will pick you up from your hotel or place of choice and you will enjoy a 8 hour private tour of Madrid and Las Rozas Village. Your driver, with the professional tour guide, will pick you up at your hotel or place of choice to start the tour (please let us know at the time of booking where you will be staying). At your own interest and likes, the guide will show you the best of the city. The royal palace, the plaza mayor, amongst other important sites of the city. After 4 hours of guided tour through the city of Madrid, you will continue, with you chaffeur in your private luxury car, to Las Rozas Village, where you will be able to enjoy some shopping time in one of the best outlet shoppings in Madrid. After you have finished at Las Rozas Village, your private driver will take you back to your hotel or place of choice.